Student loan refinancing is one-way student loan borrowers can take advantage of lower interest rates. In some cases, eligible borrowers can reduce their interest rate and save thousands of dollars over the life of their loan. Refinancing can be a good option, but our latest student loan refinancing survey revealed that many borrowers are afraid of the process. On top of that, the majority of those who refinanced their student loans only applied with one company. Here’s what we found about borrowers’ sentiments around refinancing. A majority of borrowers are afraid of refinancing. 85% of borrowers surveyed stated they had some sort of fear related to refinancing. Borrowers are hopeful for new federal student loan forgiveness programs. Out of all student loan refinancing fears, the top fear was possibly passing up any new government student loan forgiveness programs (32%) in the future. Refinancing fears are keeping borrowers from potential savings. 65% of borrowers surveyed hadn’t refinanced their student loans. Federal protections make borrowers hesitant about refinancing. 61% of borrowers surveyed hadn’t refinanced due to federal protections like income-driven repayment (34%) and Public Service Loan Forgiveness (25%) and other protections like forbearance and forgiveness (2%). Borrowers assume refinancing is only available once. Half of borrowers didn’t know you can refinance more than one time. For those surveyed who did refinance, the most important factor when refinancing was lower interest rates (76%). Another 15% of borrowers cited that repayment options were the most important thing to them during the refinancing process. Making up the other nine percent, borrowers said that customer service, corporate responsibility, unemployment protection, or death and disability discharge were the top priority for them when refinancing. The borrowers who refinanced had a major interest rate drop, too. Our data showed that from this group, 24% of those who refinanced had their interest rate cut more than 3%. Another 24% had their interest rate reduced 1% to 1.5%. Twenty-two percent of borrowers were able to shave off 2%-2.5%. These interest rate range reductions were the top answers, which showed us that those who did refinance ended up slashing their interest rates in a major way, potentially saving thousands of dollars in interest which could then be applied to the principal balance. For example, a borrower who owes $50,000 at 6.6% and drops their interest rate two percent to 4.6% will go from paying $18,434.33 in total interest to $12,472.54. That’s close to six thousand dollars in savings. Borrowers with higher balances stand to save even more. What gets in the way of receiving the best interest rate out there is not shopping around. As our survey found, 40% of borrowers who refinanced only applied with one lender! Compared to other types of refinancing, like with a mortgage, student loan refinancing is a much easier process. Refinancing a mortgage, for example, can mean application fees, property taxes, lots of paperwork and other associated costs. Student loan refinancing, on the other hand, is free and you can check your rate at various lenders easily and apply online. Yet borrowers still aren’t doing their due diligence, despite the process being much simpler. Even then, it’s possible for borrowers to refinance more than once to continue to score the best rate possible, yet half of the survey respondents didn’t even know this was an option. The majority of the borrowers surveyed hadn’t refinanced their student loans (65%). A part of that can be due to a lack of knowledge of the student loan refinancing space. Two-thirds of respondents said they knew between zero and two student loan refinancing companies, before learning about Student Loan Planner. Of that figure, 40% of borrowers knew of 1 or 2 companies while a whopping 28% of respondents said they didn’t know any student loan refinancing companies. This number is interesting given that the student loan refinancing space has exploded in recent years. Given that, the lack of knowledge could indicate that student loan borrowers aren’t well-equipped with understanding all of their post-graduate repayment options. Similar to the fact that many student loan borrowers in default are unaware or not taking advantage of income-driven repayment, many borrowers aren’t aware that refinancing exists or how it can help. Aside from general awareness about the student loan refinancing options out there, another big reason borrowers aren’t refinancing could be related to fear. Our survey data found that a solid 85% of respondents had student loan refinancing fears. But is student loan refinancing a bad idea? Not always, and we spoke to Mark Kantrowitz, student loan expert and VP of Research at Saving For College to uncover why some student loan borrowers are nervous about refinancing. The fact is that student loan refinancing is relatively new and it’s clear from our survey that the majority of borrowers aren’t familiar with student loan refinancing companies and what they do. That lack of familiarity can cause unease and as Kantrowitz noted, borrowers mired in debt can be naturally distrustful of lenders when they already feel buried in debt. 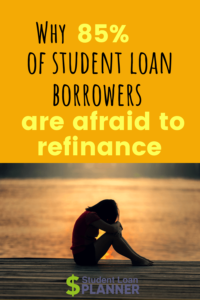 Some fears our survey respondents had that kept them from refinancing their student loans included: losing a job (6%), life changes making payments unaffordable (24%), and the tax consequences related to forgiveness getting eliminated (7%), other things like losing out on PSLF eligibility, getting a bad deal and not knowing who to trust (15%). Only 15% of respondents said they did not fear refinancing. But the biggest fear that borrowers cited was their fear of missing out on future government forgiveness programs (32%). This fear around a losing out on a new student loan forgiveness program that might never come and uncertainty around federal loans in the future is actually preventing borrowers from saving money through refinancing today. When you refinance your student loans, they essentially become private student loans so any federal protections, like student loan forgiveness, are no longer be available. Currently, federal student loan borrowers can opt for Public Service Loan Forgiveness (PSLF) after 10 years of working in public service, or get student loan forgiveness under an income-driven repayment plan (IDR), if there’s a balance left at the end of the repayment term. 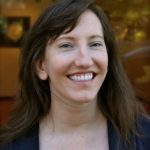 Some teachers may be eligible for Teacher Loan Forgiveness as well. What can seem like great options on the surface come with strings attached, though. For example, PSLF requires borrowers to serve 10 years in public service which can be limiting your career path and put your income at a cap, compared to other jobs. You must also get approved before receiving loan forgiveness and the first PSLF cohort is less than encouraging, with one percent of borrowers being approved for forgiveness. For borrowers pursuing forgiveness under IDR, there could be a huge tax hit in the future. Under current IRS rules, forgiven loans under this plan are taxable which can result in a big tax bill. Borrowers must meet various requirements to qualify for Teacher Loan Forgiveness. Though these are the current options for federal student loan forgiveness, the borrowers surveyed were fearful about refinancing, believing that there could be additional forgiveness options added in the future. But how likely is a new government student loan forgiveness program on the horizon? “Congress is unlikely to make major changes in loan forgiveness programs. Policymakers love income-driven repayment plans, which is why they all want to put their mark on it,” noted Kantrowitz. Student loan forgiveness options through IDR and PSLF are hot-button issues. Political figures want to make changes, while student loan borrowers are wondering about the future and the reality of student loan forgiveness. Student loan forgiveness can be complicated for policymakers and student loan borrowers alike. Of course, there’s the nagging question about who will pay for all of it, leading some politicians to loathe this particular student loan perk. So while there are student loan refinancing fears, relying on a new student loan forgiveness plan as some sort of cure-all for overwhelming student loan woes is unlikely — or perhaps not like one would imagine. Some borrowers could be sitting on thousands of dollars in interest savings out of fear and unfounded hope. Refinancing can be useful to lower student loan interest rates, but there are times it doesn’t make sense and student loan forgiveness is a better option. Here are a few cases when student loan refinancing is a bad idea. Public-sector teachers taking advantage of Teacher Loan Forgiveness and PSLF. Given that these professions typically come with a lower salary, opting for student loan forgiveness can be a good option. There are no tax consequences under PSLF related to forgiven loans, unlike loan forgiveness under an IDR plan. Student loan borrowers who are struggling to make payments on their student loans. These borrowers should stick to income-driven repayment and start saving for taxes if it looks like student loan forgiveness under this option is the best route. Borrowers who aren’t offered a rate that is lower. Even though many refinancing companies can help student loan borrowers lower their interest rate, that might not always be the case. You’d want to check your prospective rate with the lender to see what you qualify for. If the rate isn’t actually lower, forgiveness might make more sense. Borrowers who would have unaffordable payments under a new repayment term. It’s key to look at the repayment terms as it could change your monthly payments. For example, if you got a lower interest rate but your repayment term is shorter, your payments will likely be larger than what they currently are and could be unaffordable. Borrowers who have poor credit, unstable work or a high debt-to-income ratio. Student loan borrowers in these situations aren’t likely to be approved for student loan refinancing. Student loan borrowers in the public sector and those with high-balances that don’t have a corresponding high income or profession-related forgiveness options. In these instances, it’s best to stick with forgiveness. Though these are general guidelines, at the end of the day, there is no cookie-cutter advice as everyone’s situation is different. Refinancing can save borrowers money, but it’s not for everyone. Student loan forgiveness can be a great option, but it’s also not for everyone. The key is exploring all of your options and doing what’s right for your situation. This student loan refinancing survey was conducted via Survey Monkey on January 11, 2019 with 949 Student Loan Planner subscribers in the U.S. as respondents. Why haven’t you refinanced your student loans? Has that been something you have thought about doing?